Gypsy Caravan Tribal Bellydance ®, Teacher Training Online, Level Three! Starting Saturday, May 4th, 2019, for four weeks, in your inbox! Move up to the next level and join our growing Global Teaching Team… Transitions — Putting it all Together — Dancing Together — the Comfort Zone *Four weeks of instruction with the Intermediate Level Two steps,… Read More..
:: Illumination :: the Mastermind with Paulette Rees-Denis Transformational Lifestyle and Creativity Coach Join us now…. Illumination: Elevate and Illuminate, Mastermind I offer this about once a year, to share and guide creative women on the path of envisioning possibilities, attracting money and abundance, tools for manifesting change, re-connecting with body, mind, and spirit,… Read More..
Tribal Grooves® Teacher Training Online with Paulette Rees-Denis **Register now to hold your place… now online! Starting June 8th through June 15th, 2019 Divine Feminine Fitness! 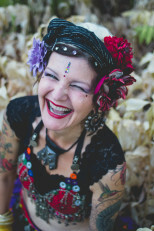 Tribal Grooves® — an exciting and invigorating dance format using feminine moves from Gypsy Caravan Tribal Bellydance® to activate your body, mind, and spirit! We move with non-stop, soulful… Read More..
What is Gypsy Caravan Tribal Bellydance®? Moving your body just plainly feels good— gets the blood moving, the heart pumping, the joints juiced up…and brings you right into the moment—the be here now factor! When you move and dance, it strengthens the body, tones the muscles, and loosens you up, releasing tensions, aches, thoughts, whatever… Read More.. 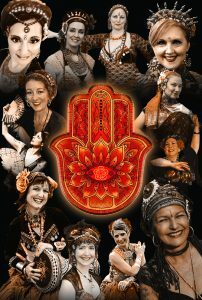 Gypsy Caravan Dance Company, Int, the dancers and Master Teachers, have come together to bring you this magnificent Manifesto to share with you, the values and inspirations of what makes Gypsy Caravan Tribal Bellydance so powerful, evocative, and what and why we continue to bring the global community together! Please view and download for your reading… Read More..
our NEW online membership program for you– dancers, bellydancers, tribal-inspired… join us! Don’t miss out…Next opportunity to join us will be April 1, 2019, registration will re-open March 9th! We are having so much fun joining tribes and dancers around the globe, drilling, dancing, chatting it up! Hope you can join us for April! You can join quarterly or yearly! Whether you are just starting dancing or are a seasoned pro, this is all about the Gypsy Caravan Tribal Bellydance® philosophies, the moves, the dance, the lifestyle, the community. It is a universal dance of connection and belonging… a circle of energy and magic… a creation in process and progress. Empowerment, mind-bending discoveries of self, of blooming, opening, life making sense, moving the body poetic, physical strength and fitness, feminine beauty, of ways of expression through the body, heart, and soul. My Collective Soul experience has greatly changed my life inside and outside of dance. Paulette is a gifted teacher and fascinating force! The dance and fitness information is fantastic and every minute of the course is really fun. An added bonus were the many tips and suggested readings and programs outside of dance that Paulette gave us. A fantastic experience for anyone. If you want to improve your understanding, knowledge and practical dance skills, then CS or TT training with Paulette, I highly recommend. Not only will you find yourself evolving as a dancer, but as human being, an individual and a member of the community. Collective Soul has made me so much more aware of my technique, in particular my posture. It has helped to build my confidence in dancing and in sharing that dance. But, more than that it has helped me to become more aware of myself as a dancer, of why I dance and of how this beautiful dance speaks to me. It has been a most significant step on my dance journey towards becoming the very best dancer I can be. Doing the Collective Soul 1 and Teacher Training 1 has helped me to develop my dance personally, helped me to grow with it. I find I am dancing with more confidence. It has inspired me to develop further, take more courses, workshops and learning. I am always eager to learn more and more. I find I have studied myself more closely, my posture, my presentation, my projection, so that I can dance to the best of my ability and really be me when I dance. At present, I’ve attended two levels of Collective Soul. They were two different experiences, but both intense, inspiring, strengthening and healing for my body and soul. As well as having learned the technique and all that concerned Tribal Bellydance as a discipline, I had fun dancing and experimenting new formations. I've appreciated and enjoyed writing the “Morning Pages”, sharing my thoughts and discussing some topics with Paulette and the other participants. And, most of all, opening my heart and my soul to all of them. The Collective Soul certification represents a commitment to myself, my dance, and my students. Myself because I’m FINALLY doing something for ME. And that’s huge (as I discovered this session!) because I don’t really do much for me. For my dance because, well, I’d been pretty lost and not sure what I was doing with it. CS and TT both have given me a solid path and that’s pretty damn exciting. And for my students this is of course something I can learn and work to bring back to them.